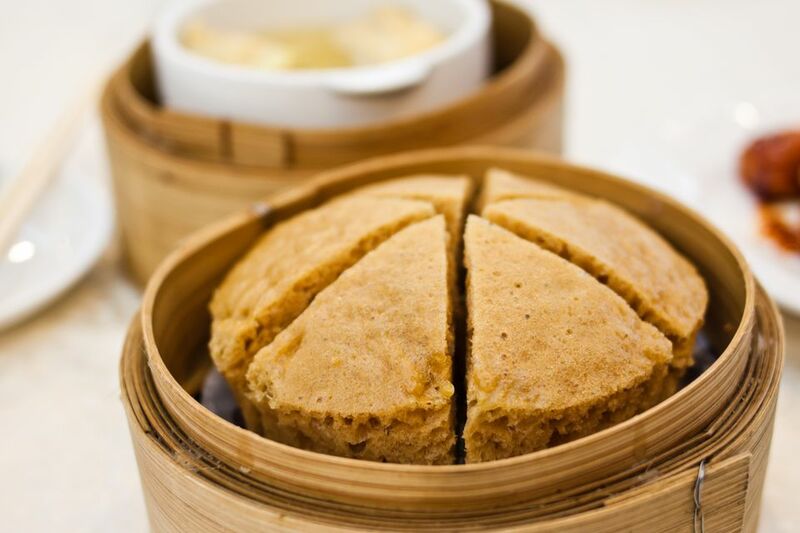 The secret of this recipe for Chinese sponge cake lies in the fact it is steamed, which makes it very moist. Traditionally the sponge cake is eaten plain, but you can also serve it with strawberries or other fresh fruit for a light dessert. Line an 8 X 8 or 9 X 9-inch cake pan with parchment paper. Prepare a wok for steaming. Separate the egg yolks and the egg whites. In a medium bowl, beat the egg whites until frothy. Add the cream of tartar and beat briefly. Add 1/4 cup of sugar and beat for another minute (don't let the egg whites stiffen). Add the egg yolks and the remaining 1/2 cup of sugar. Beat for about 2 more minutes. Stir in the almond extract. Gradually add the flour mixture to the egg mixture, stirring. Mix thoroughly, but do not beat. Pour the batter into the cake pan. Bring the water in the wok to a high boil, then turn down to medium. Steam the cake, covered, for 20 - 25 minutes or until a toothpick comes out clean. Cool the cake on a rack. Invert onto a plate and remove the parchment paper. Invert onto another plate so that the cake is right side up. Cut into squares.